On May 6, 1979, 125,000 people marched on Washington, D.C. to protest the proliferation of nuclear energy and nuclear weapons. I was there. In the mid-seventies, my partner and I were totally ignorant of the eminent dangers of nuclear power and the unthinkable threat of the devastation of nuclear war. Living near Gainesville, FL at the time, we were enlightened by a friend of ours when we told him of our plans to buy a farm outside Jamestown, TN. He asked us why we wanted to live just over the hill from the largest nuclear weapons plant in the world. We were dumbfounded. Then he showed us a map depicting all of the nuclear power plants, weapons facilities and dump sites in our country at that time. We immediately began educating ourselves. And then we got busy. We joined The Catfish Alliance, an anti-nuclear activist group in Gainesville. We rallied supporters. We spoke on the U of F campus. We gathered signatures on petitions. We worked to secure information via the Freedom of Information Act. 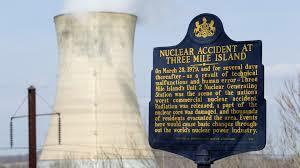 Then, on March 28, 1979, there was an accident at Three Mile Island in Pennsylvania. “They came from Harrisburg, thirty-three buses full. From Vermont and Alabama. From Illinois and Florida. From Kentucky, Ohio, Pennsylvania, and New York. From New Jersey, Maryland, Virginia, and Connecticut. From Rhode Island and Massachusetts. In all, they came from more than thirty states, and they filled Pennsylvania Avenue May 6 to demand an end to nuclear power. 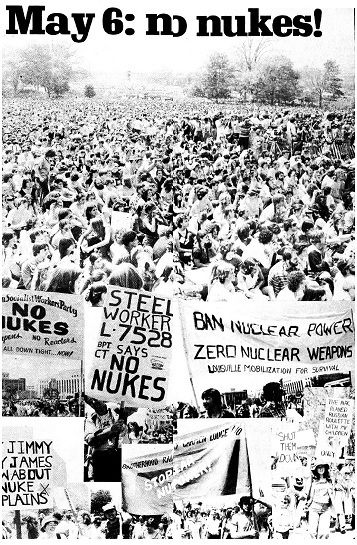 “The unexpectedly large turnout, making it by far the biggest antinuclear protest ever in this country and one of the largest in the world, sharply indicated the spread of opposition to nuclear power since the Three Mile Island disaster. That was us. Our flagship bus was a converted school bus emblazoned with Catfish Alliance and anti-nuclear symbols and we were piled in, filled with the hope and enthusiasm that we were going to make a difference. My partner and I didn’t move to Tennessee then, but West Virginia instead. There were no reactors and people there had voted down attempts to locate a nuclear waste dump site in their state. We figured that was a good sign. Active again, we rallied in Charleston, wrote articles for local newspapers and spoke to folks everywhere. Subsequent reports indicate that things did slow down, but here we are; the year 2017 and we are witnessing/experiencing the devastating effects of nuclear disaster in Japan (Most people are hardly aware of the Chernobyl meltdown, described as “one of the most significant man-made disasters in history,” or other “accidents” here in the U.S.) and looking down the barrel of a real threat of nuclear war. One from which there will be no winners. Well, I guess I got complacent, or just lazy, doing life. I haven’t marched in a long, long time. But I certainly haven’t stopped “speaking.” I am comfortable on my soap box, ever hopeful that it’s not too late and that I can make that difference.